Don Drake has done it this time. He has gone – sunk, if you will – to extreme and damaging levels. Anything was worth it to get some respite from the Burned Man, the demon he once – foolishly, arguably – invited in. In the not-so-nice part of Edinburgh, whisky for breakfast, worse for lunch, Don is definitely out of his comfort zone, and possibly his mind. For a change. London was his place. He knew how everything worked. Here, all is unfamiliar. Even Don. Sometimes the Burned Man speaks for him. Sometimes he fends off his enemies. Sometimes he maims them, or worse, all from within Don. Here, all is unfamiliar, even the lowlife, scary dregs of magical society that in London Don would call his peers. And one who knows without being told that Don is not alone in his mind, one who knows this and is not afraid, cannot be a good man to encounter. There is something about this one that he just cannot put his finger on. But this one might be the one to have the answer Don needs. If this is rock bottom, he knows it only gets worse from here. No stopping now. 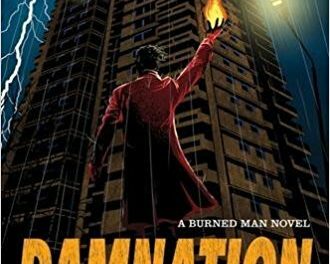 If you haven’t already discovered the Burned Man series then it is high time you did. Damnation picks up six months from the last book with Don in hiding and in what can only be described as a complete state, which he details for the reader in that fantastically witty, self-deprecating voice that in this instalment had me laughing out loud in public places – and that is a good thing, if you were not aware. 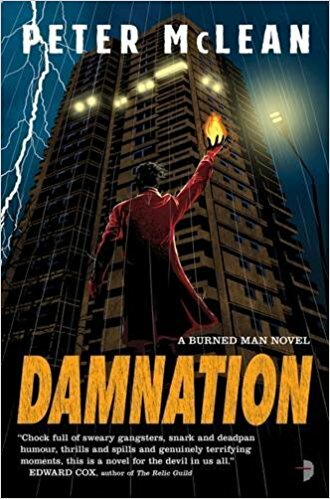 If I had to find something to criticise, then it would be that in this book, Don’s story escalates to nowhere near a conclusion (which means there is at least another book to come and that is excellent) so I am left waiting and wanting the next part, whereas the first and second seemed more contained in terms of their main story arcs. That aside, angels, demons, sinister characters, a terrifyingly powerful goddess, and a lovable – if at times cowardly, sheepish, and not nearly apologetic enough – main character make this a thoroughly entertaining foray into the supernatural and the faults of human nature. Say no more. Read.